Wheeling the bikes out of the Kongrad station at midnight and through the police checkpoint we were immediately into a busy market. There was no street lighting but the stall holders had torches pointing onto their stands hoping to trade with some of the 2500 people who had just got off the train. Most people were getting into taxis, we were looking for somewhere to sleep. Soon, a short, round lady approached us, “hotel?”, we were hesitant, sometimes you don’t want help. Quickly evaluating our situation (early hours of the morning, no lighting, no signs of any commercialism), we accepted. And with that we were marched off towards a small alleyway. Not fully sure of the situation we stopped. “Your hotel?” we asked: yes. “Your house?”: yes. Now we understood – with price checked (£7), we continued. We managed to deciphered that showers where an extra 7000 sum (£2) and somewhere outside. Her 19 year old son then arrived and we agreed and follow him for our second mystery adventure of the evening. We eventually arrived at the showers which were in another house on different dark street! Money exchanged we sat in the courtyard awaiting our turn. The shower was in a very nicely tiled wetroom, the toilet however was a shed at the bottom of the vegetable garden and over a earth hole. A hot and smelly affair! 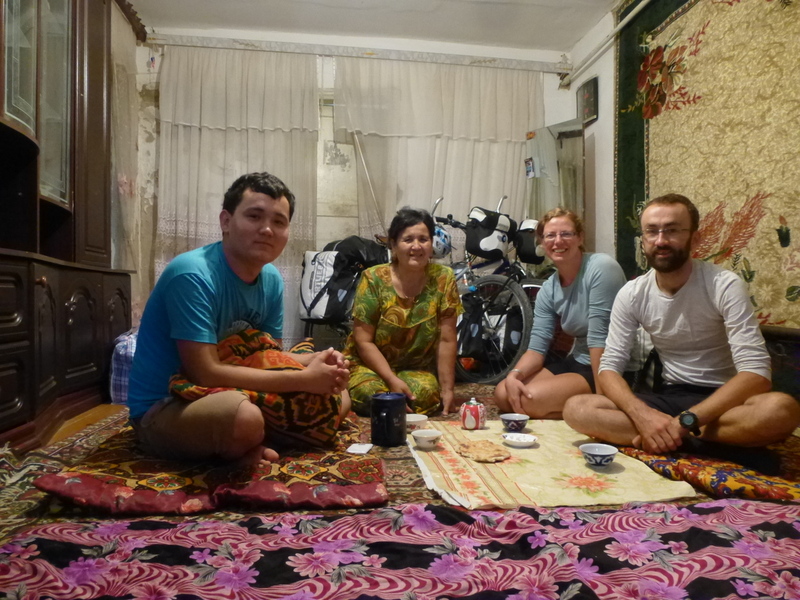 We slept on the lounge floor on vibrantly coloured mats, the bikes alongside. Breakfast was also on the floor! Our Bed, and Breakfast, literally. Loaded with 5L of water each and plenty of instant noodles from the market, we left the house and headed of for our first proper desert ride. It was 105km to the next town of Moynack and we knew it was flat so should be achievable in a day, even so, we had the lights charged ready in case we ran out of daylight! The ride was a hot affair with typical temperature of 38degC, not as hard as it sounds but very, very monotonous! We came across a melon stand at the half way distance so stopped for a lunch of watermelon and noodles. After resting in the shade to avoid the worst of the heat we set off at 16:00hrs but we had to stop twice more as the heat was too great. 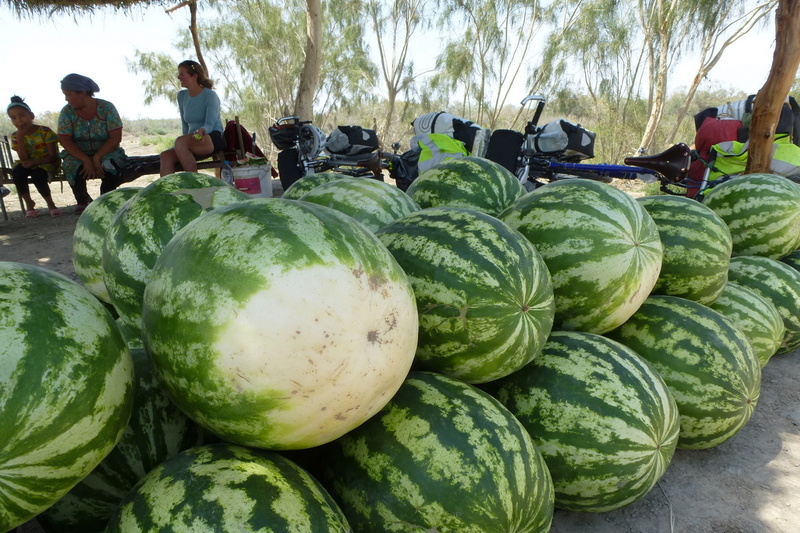 Watermelon stop – Too hot to cycle! On entering the Moynack the first priority was to find an ice-cold coke. The second priority was to take photos of the ships in the evening light. The third was to find a hotel, preferably with A/C. Coke secured we headed to find the remains of the abandoned fishing fleet – since the Soviets diverted the rivers that fed the sea, the water is now 150km away from the old port and still retreating! 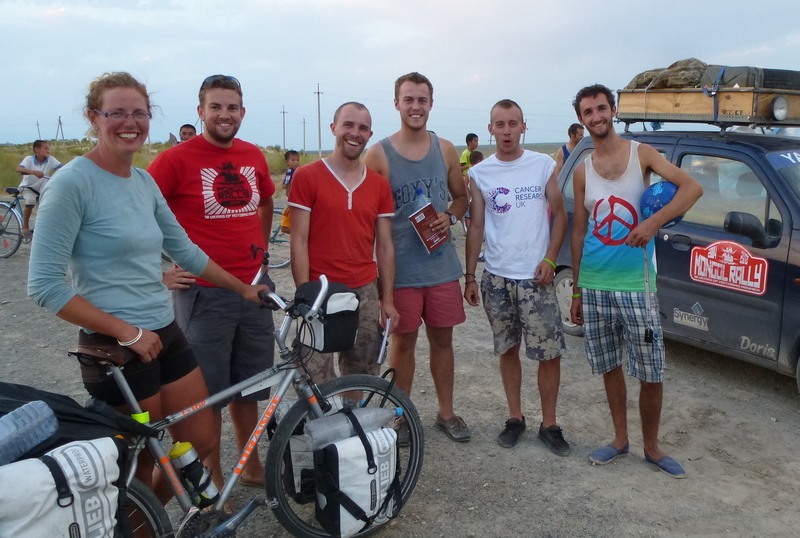 Three British Mongol Rally cars/teams were also there taking photos and had attracted most of the towns children. (On of the kids took our pump whilst we weren’t looking, grrr!) With the light fading we set of to find the only hotel in town… it must have A/C, right? Wrong, it didn’t even have running water! 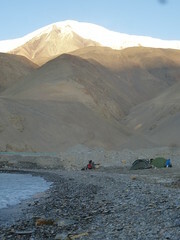 The price was steep, but Tim was beginning to feel ill which meant that camping wasn’t really an option, so we paid up. The shower was a shed in the garden with a rusting water tank on its roof and a tap in the ceiling. We decided not to risk it and washed in mineral water that night! Tim’s condition got worse, and like an overheating car radiator, his stomach boiled over during the night. It was so hot – there wasn’t even a fan in the room. 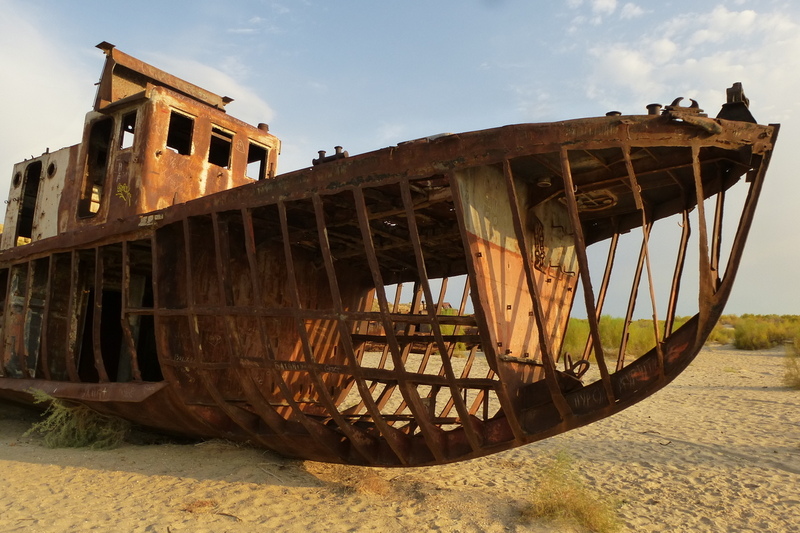 Brits on the Mongol Rally – A boat lies where once there was sea. Tim spent the morning dozing in the shade whilst Rebecca raced around the town looking for cold lemonade. The problem was now to decide what to do for the best – stay in the hot hotel with no water, or risking move to better accommodation with air con? 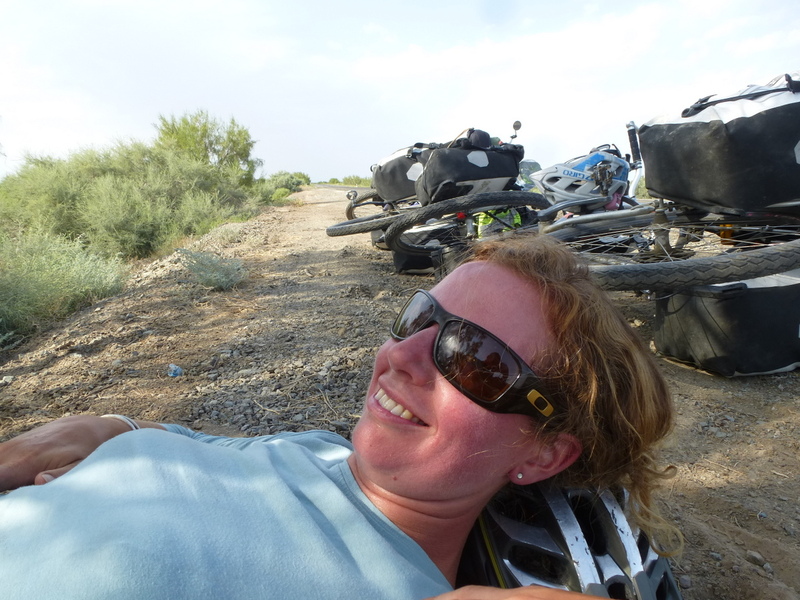 Rebecca packed the bikes and we rode 4km to the bus stop, Tim was seriously dehydrated and it was the hardest riding yet, in the hot dusty wind his mouth felt like it had been filled with glue. The bus trip was a bumpy dusty 4 hour ride, but at least the open windows provided a cooling breeze. As a sign of just how ill Tim was feeling, when we arrived at Nukus bus station, rather than riding into town to search for accommodation, we got straight into an over priced taxi (beaten up Lada with roof racks for the bikes) and headed to the hotel. Of course that hotel was full, but another expensive taxi ride later we were checked into the nicest hotel we have stayed in yet. With the air con set to a refreshingly cool 22degC we crashed out! 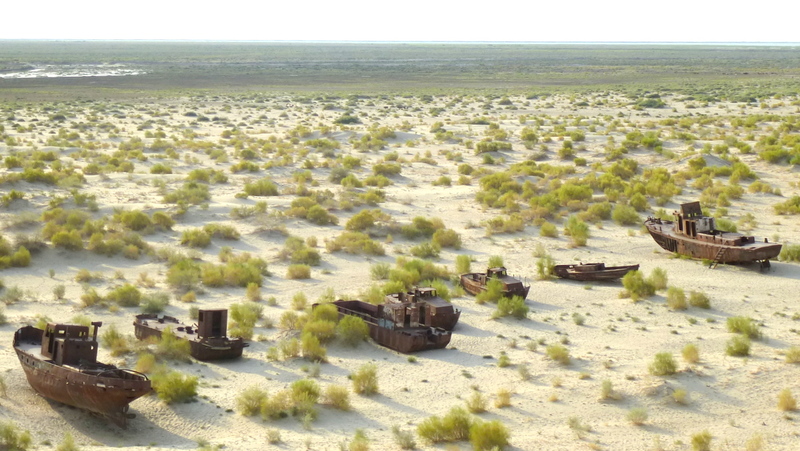 Fishing boats looking out towards the Aral Sea.. it’s now 150km away!